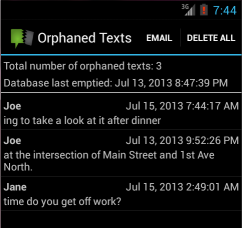 Orphaned Texts is an Android app that serves as a workaround for Android issue #28697 which manifests itself in incoming multi-part SMS messages containing parts of previously received messages. This app allows the user to view, export, and delete those message parts that are incorrectly treated as belonging to new messages. sm2anki is a Python 2.x module designed to convert SuperMemo collections containing audio files to Anki. This is a Chrome extension that brings a regular password field back to the BZWBK24 login page allowing the users to enter their full passwords rather than specific characters to log in to online banking. This is especially convenient for KeePass users. Only characters requested in the form are sent to the server.